Last night as the University of Washington Husky Band was making it's way from Seattle, WA to Pullman, WA for their annual Apple Cup game against Washington State, a bus carrying the saxophones and baritones flipped on it's side. 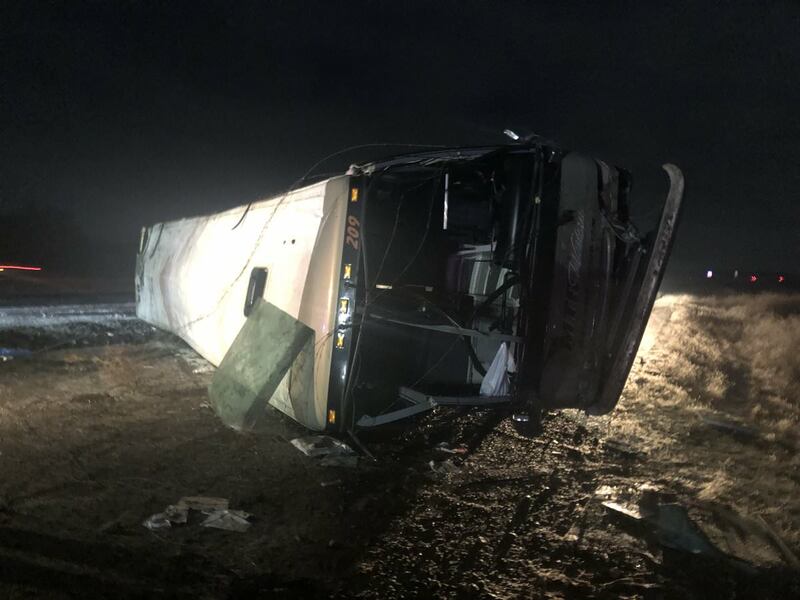 The bus was carrying over 50 members of the band and between 40-45 members were transported to local area hospitals for injuries. Those that were uninjured were loaded onto the other buses and all were taken to a local elementary school in George, WA. We are happy to report that only a few members of the band remain at the hospitals. Most had been discharged by 5am PST this morning. No major injuries were reported by those that were taken to hospitals. The band missed their scheduled dinner in Spokane so families from across the George, WA and the Moses Lake, WA areas rallied together and brought their Thanksgiving leftovers to the elementary school to feed the entire band. The outpouring of love and support for the band was huge. The entire band was fed. Due to the recovery of the students and potential for more bad weather, the band has made the decision to not continue their journey to Pullman for the game. The band will remain in their hotel and watch the game together while everyone heals both emotionally and physically. Thinking of everyone in the @huskyband right now. Hope everyone is ok.
Our thoughts are with the @huskyband family. We hope everyone is ok.
Keep the band in your thoughts especially those students who are still in the hospital. Hopefully everyone will be released today.